Land lubbing crocs get their day in the sun. Also, there’s a varanid special on NOVA. 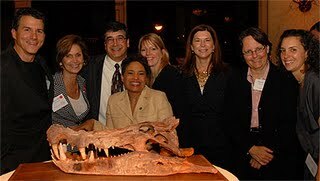 Dr. Paul Sereno stands with others at a meeting for the American Association for the Advancement of Science in Chicago. Note the wheelbarrow like retroarticular processes on the "boar croc." After spending? a few years collecting and looking at the weirdness that is Gondwanan crocodyliformes, Dr. Paul Sereno has finally started to unveil stuff. With the help of National Geographic comes When Crocs Ate Dinosaurs. It appears to be a special that focuses on the remarkable – and often underrated – diversity seen within this group of animals. The highlight of the program (at least in my opinion) is the focus on all the very un-crocodile like crocodyliformes. The National Geographic website has a special section that shows off the various, apparently unnamed, taxa. For now, there are just placeholder names that will likely hurt the eyes and ears of anyone who had to deal with the aftermath of The Land Before Time. The artwork is by artist Todd Marshall. I’ve always enjoyed his portrayals of prehistoric reptiles (he tends to get almost too fanciful with dewlaps and spikes though). Sadly the accompanying animations do not do Marshall’s incredible artwork justice.? It will be interesting to see how it all gets integrated into the television show. Also airing tonight is a special on NOVA entitled: Lizard Kings. It features the work of Dr. Eric Pianka; a well known and respected lizard ecologist who has focused on monitors for much of his career.? The special looks to be very interesting. Especially given that it appears to have taken years for the film crew to get the footage they needed. As you read this the special has already aired. However, PBS does make their shows avaialable to watch online for free, on their website. The show should also be viewable on Hulu by tomorrow. 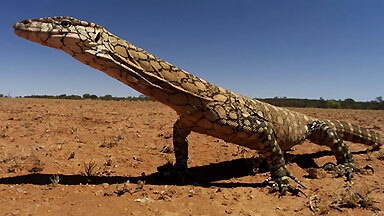 A perentie monitor (_Varanus giganteus_) poses for the camera. I realize that both of these options are only available in the states. To date there seems to be no international options. At best there are some workarounds. Still, for those that can get them, both shows should prove to be entertaining.